Within 250 miles of Newburgh, IN. From 50 to the mile, swimmers who attend this high performance swim clinic will improve their freestyle speed and power by learning from Olympic gold medalist Nick Thoman! Learn new and unique drills to refine your skils and improve your tehnique so that you can DROP TIME! This clinic is for swimmers ages 12 and up. Younger swimmers with “A” Motivational Time Standards or faster are also encouraged to sign up. Freestyle is the most technical stroke and it is also the stroke that you swim more than any other. 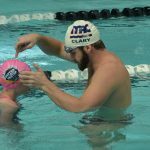 Nick Thoman will be in the water teaching both basic foundations of technique all the way to challenging drills designed to help your swimmer approach technique differently at this high performance swim clinic. Bodyline: Your freestyle will never be fast without a strong bodyline. Your swimmer will learn to maintain good posture and engage their core to have a foudation for a stronger and faster freestyle. Swim more balanced so that you can swim higher up in the water. Kick: Become a stronger and faster kicker through learning about both the technqiue and timing of each kick from an Olympic gold medalist. Pull Pattern: The goal is to be as efficient as possible in pushing your body past your hand. Your swimmer will learn to grab onto the water with longer and stronger arm pulls. Work on each component of the pull to maximize the effectiveness of each stroke. Rotation: Your swimmer will learn to utilize their rotation form more connection and power out of every stroke and every kick. Breath: All swimmers know to keep one goggle in and one goggle out when they take a breath, but do they know when and how long to breathe? Laura will show you how to make each breath more efficient for faster freestyle racing no matter what distance. Distance Per Stroke: Nick will work with swimmers to understand the meaning of their stroke count and learn new ways to maximize their distance per stroke in a variety of freestyle races. Swimmers and parents are invited to ask Nick questions during a Q&A session. Gain insight into his training regimen, diet and nutrition, and recovery tactics. Use Nick's story as inspiration for your swimmer to feel empowered to continue to chase their goals.